Here is an unsigned editorial published online July 9 by America magazine, a national Catholic weekly magazine run by the Jesuits. President Donald Trump’s nomination of D.C. 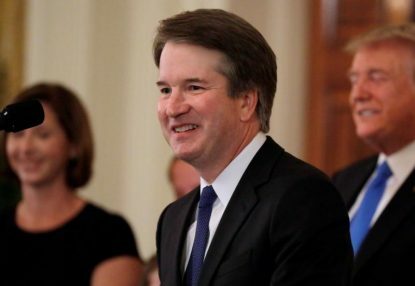 Circuit Court Judge Brett Kavanaugh to fill the seat on the U.S. Supreme Court vacated by Justice Anthony Kennedy may furnish the fifth vote needed to overrule Roe v. Wade, the 1973 landmark ruling that legalized abortion in every jurisdiction of the United States. Judge Kavanaugh is a textualist who is suspicious of the kind of judicial innovation that led to the court’s ruling in Roe. That decision removed a matter of grave moral concern — about which there was and remains no public moral consensus — from the democratic process. Reversing Roe will not make abortion illegal in every jurisdiction. It would simply affirm the right of the people, through their legislators, to make the law, while upholding the right of the judiciary to say what the law is. Thus, more than 40 years after the court ushered in an era of abortion virtually on demand, voters may once again have the right to debate the issue and determine what public policy should govern. This should be a welcome development for the millions of people who in dozens of public opinion polls have registered their objection to the expansive permissibility of the Roe settlement. It should also be welcomed by all those who believe that democracies should settle such matters by argument and voting rather than judicial fiat. The prospect of reversing Roe increases the stakes in this nomination battle. That potential reversal, however, effectively returning abortion politics to the states, offers the way to prevent the issue from continuing to dominate future Supreme Court nominations. Yet the possibility of a fundamental change in the abortion debate also affords the church an opportunity to reimagine its public witness on this and other pro-life issues. The church should not abdicate its responsibility to bear witness to a consistent ethic of life from conception to natural death. But the possibility that Roe might be overturned impels us to consider how we might more effectively use our voice in the public debate that will follow. We should begin by avoiding the intramural argument that has consumed too many Catholics — namely, whether other pro-life issues are as important as or more important than abortion. This argument is itself an artifact of Roe’s removal of abortion from normal political debate, which has led to claims that opposing Roe must override all other pro-life concerns. The truth is that there are grave and important issues for pro-life people beyond abortion, including euthanasia, the death penalty and sane immigration policy. These issues, however, must not be traded off against the defense of the lives of unborn children. If Roe is overturned, continued Catholic advocacy for a comprehensive medical and social safety net for expectant mothers will be crucial in order to save lives and render abortion an even less appealing choice to the public conscience. At this juncture, anyone who recognizes the humanity of the unborn should support the nomination of a justice who would help return this issue to the legislative arena. Overturning Roe would save lives and undo a moral and constitutional travesty.